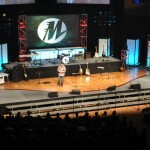 The 2013 edition of Momentum Youth Conference kicked off Tuesday evening with the opening session in the Chapel Auditorium at Indiana Wesleyan University, Marion, Ind. Keith Minier, pastor of Grace Fellowship, a Grace Brethren congregation in Pickerington, Ohio, challenged the students to love out the “I am Second” theme this week. “We still live like we are first,” he said. “There’s a better way.” He stressed that it begins with an others first, I am second attitude. He urged students to train to win in that moment when standing alone is necessary. He said that it’s a lot easier to direct others to Jesus when you’ve lived like him. The session opened with a light show using the Wham City Light app. Smart phones, iPod Touches, and iPads around the auditorium sparkled with bright colors as music played. Jeremy Byng and the Link Collective, from Grace Community Church, a Grace Brethren church in Goshen, Ind. (Jim Brown, pastor) led worship. Also on the schedule on Tuesday evening were illusionist Brett Myers; a video from Urban Hope, a ministry in Philadelphia, Pa., that is sponsored by CE National, with the testimony Catina Pettis; and information about outreach events during the week. Tomorrow’s sessions will include the morning speaker, Jeff Myers, and the evening speaker, Afshin Ziafat. New this year is a live stream of each of the main session speakers that is broadcast free of charge. Visit http://buildmomentum.org/ and click on the starburst to find out more. 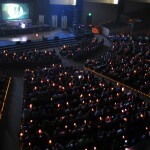 Nearly 2,000 students, youth staff, and guests from around the U.S. are attending Momentum. The event, sponsored by CE National continues through Sunday morning. A light show using smart phones and other devices opened the evening. 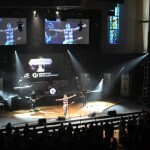 Jeremy Byng and the Link Collective led worship. 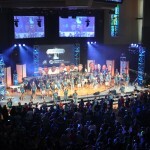 Keith Minier challenged students to live out the “I am Second” theme of the conference.